I just found a new feature of Windows 7 that may or may not have been was added in Vista ( I upgraded from XP). 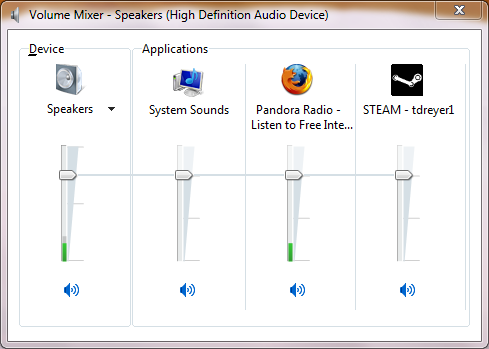 In the sound management window, you can choose individual applications and mute them selectively. I have been wanting this since windows 95!!! It only took them 15 11 years to do it too! Well, I have been running my multi-boot system for a couple of weeks now, long enough to make some early predictions about the two operating systems that I have been using the most. Up to now, I have not done much with Sabayon on this machine so I do not have much to say about it. Ubuntu and Windows 7? Oh yeah. Ubuntu 9.04 is another solid release from the Canonical supported community. With the exception of a few glitches that were not there in 8.10, 9.04 runs extremely smoothly. Faster boot times and the new ext4 file system are just 2 of the many improvements. I think that my favorite thing about this release was the new themes that were provided that are great improvements on the default Ubuntu theme. My biggest bone to pick is that if you want to customize the system sounds, Ubuntu only acknowledges about half of the changes! Oh well, small problems. Overall, 9.04 is a great release. I think the thing that I have been most impressed with is Windows 7. Microsoft has really pulled out all the stops for this update to the unfortunate Windows Vista. Basically, 7 is Vista fixed. It is faster, smoother, and oh so nice to work with. I never really thought that I would be one to sing the praises of Microsoft, but they have really done a nice job with this release. I think that my favorite new feature in Win 7 is the window snap actions. Just drag the window to either side and the window will expand to take up exactly half of the screen. Drag it to the top and it will maximize. My biggest complaint is that... that... uh... ok. I guess I don't really have any complaints yet. This is weird. O_o Gotta go find somthing in Windows 7 that is still broked. Well, I've been working on getting my computer into a new setup. With the seemingly serendipitous releases of Windows 7, Ubuntu 9.04, and Sabayon 4.1 all within 5 weeks, I figured it was time to wipe the compy and triple-boot. Well, now that I have a mostly functioning boot of the three OS's, it's time to get back outside and do some more riding. Time to wear out my new bike! A friend loaned me his Eee PC this week so that I could replace the provided Xandros distro with Ubuntu. This was my first experience with any of the low-powered netbooks, Eee PC's or otherwise, and I was quite impressed. These little machines are perfect for what they are intended for, though a larger keyboard would be a nice feature. I was also impressed with the ease with which Ubuntu 9.04 Remix installed itself. I expected at least some trouble setting it up if not installing, but it went smoother than a greased up dog on a slip-n-slide.Getting 9.04 on a netbook like the Eee PC requires the use of a thumb-drive as there is (often) no CD drive on the netbooks. Thankfully, 9.04 has a great utility to write a install image to any sizable thumb drive with ease. Just had to download the image from the daily build site, and write it to the flash-drive with the provided utility. Once the image was written, I just had to pop the drive into the Eee PC, restart it and boot from the flash-drive. A typical Ubuntu install dialog followed and the install went quite smoothly. After it was installed, Ubuntu rebooted smoothly and proceeded to load the remixed distro without problem. After installing a few programs to make the environment more useful (skype, dropbox, gimp, etc...), I proceeded to try to crash it, or at least find a few bugs. No matter what I did though, I couldn't find anything apparent! So, a few screenshots and a very poor video (sorry) later, I was done. Nothing left to do but return it. Overall I was quite impressed. As much as I like Ubuntu, I must admit that it still tends to have a few bugs early on in any release, but I couldn't find any big ones in 9.04.